I have several bird feeding stations in my yard and they are a delight to watch. Two are outside my windows in my computer room, so I can watch all day. I also have a fig tree and several pear trees. 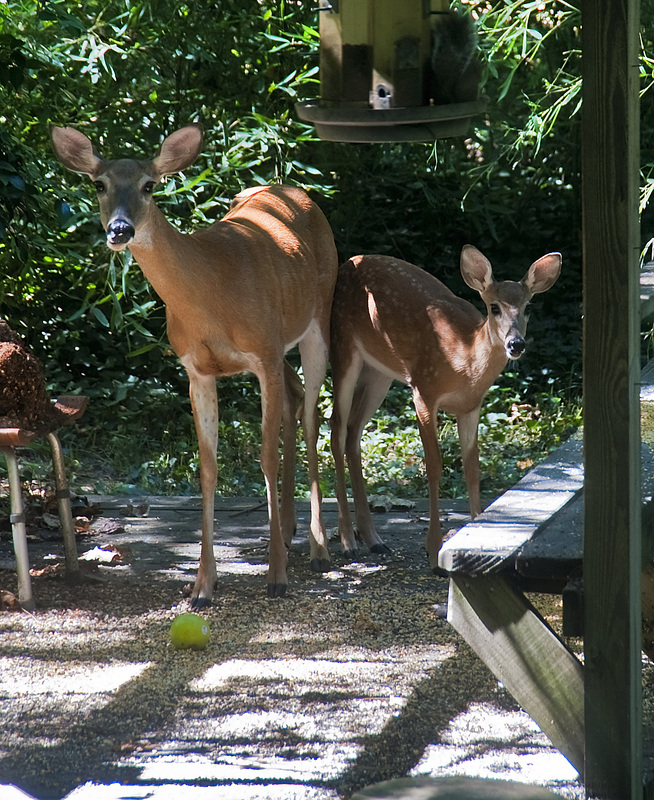 One day last year I looked up and was shocked to see a white-tail deer near one of the feeders eating fallen pears. She was so beautiful. The very next day I had cracked corn and apples added to the feeding station. To my surprise she came back and seem to really enjoy the corn and apples. I named her Doreen. I recognized her by the nick in her right ear. Day after day she returned and munched on corn and apples. Of course I wanted to train her to eat out of my hand, but I live in an area where deer hunting is a favorite pastime. I didn’t think it was a good idea to take away any fear of humans that she had. Normally hunters can only take bucks, but we do have a doe season, too. Bow hunters and primitive hunters can take buck or doe. I guess Doreen felt safe visiting my feeding station. I often wondered why no other deer came with her, so I was delighted when she brought her fawn with her. The fawn didn’t come everyday; she came maybe two or three times a week. At least that is what I first thought until the day Doreen brought two fawns with her. Over the next week or two, she would bring one and sometime two of her fawns. They were a bit skittish and so cute. Then, OMGosh, she arrived with three fawns in tow. I never understood why, but she seldom brought all three with her, usually just one at a time, less frequently two. As they grew older, Doreen and all three visited, and occasionally another doe joined the group. The fawn frisked about from time to time and chased each other. They reminded me of puppies. Sadly, when hunting season came, they all disappeared and I haven’t seen them for months. I know someone was still visiting the feeding station because I could see evidence of the corn and apples being eaten. “KEVIN, shut up. I would never hurt Doreen and her kids!,” I yelled at him. I kept putting corn out, but less and less was eaten. 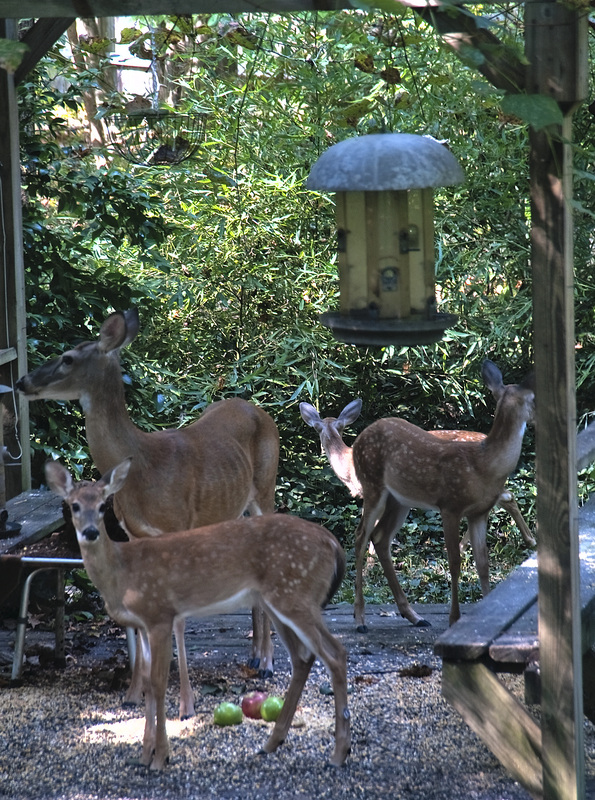 Yesterday, I was delighted to see deer approach the feeding station. One, then two, then three. None were Doreen and these didn’t seem quite large enough to be full grown, so I hoped they were Doreen’s fawn. I almost hollered when I saw her; Doreen with her nicked ear approached the feeding station. And last but not least another doe arrived. All were still in their gray winter coats, but I suspect they will be reddish brown in no time. I know one of Doreen’s fawn was a male, but none of these were male. I suspect that two of the group were Doreen’s and the third was the second doe’s. The female fawn will stay with Mom for about 2 years, but the males only hang around for a year. I was so happy to see them. I had worried that something may have happened to them.